Game Based Music Theory and Aural Skills! Since I joined "The Piano Game Club" a couple years ago, I have accumulated enough games and activities to transition away from requiring a Theory Workbook* for all students and have been able to adapt many of these games for my flute students as well! I still incorporate an element of writing, since nothing can replace that wonderful process, but I try to make this fun and engaging as well! This particular game focuses on visually recognizing intervals up to a 5th. Two players roll a die, a card is flipped over, and whoever's die is closest to the interval represented by the two notes on the card gets to claim the fish on the card in the fishbowl! 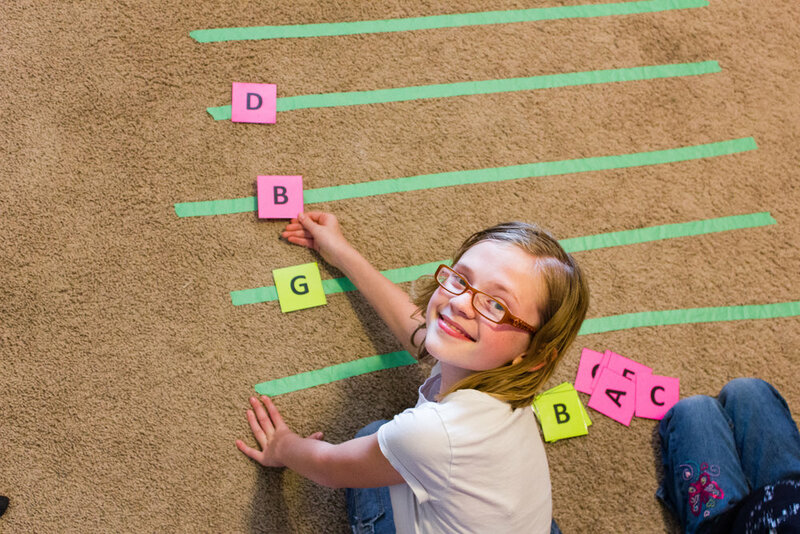 At times, I'll turn my floor into a staff that students can physically walk on to become a "line note" or "space note" and move to where the G is, etc. I also employ colored alphabet cards for students to place on the staff. Different colors could denote "Landmark Notes" or the root of a chord. I use other small manipulatives (small animals, army men, playdough, writing on dry erase sheets, glass gems, etc.) to place on the keyboard and on a staff so students can manipulate concrete objects that symbolize abstract concepts. Boring Music History is a thing of the past! Students will receive a plastic sheet for collector cards to keep track of Composer Cards that are laminated and given to the student. The backside can be filled out using a fine tipped permanent marker to learn more-and be ready to play a game of "Snap! The Composer" once the collection has built up. Each student (excluding WunderKeys Preschool Students) will receive a punch card related to practice. Some students have a specific goal, such as learning to play hymns for church, and their punch card reflects that goal; every 10 hymns learned = a prize. General students' will be awarded a punch each week when they return with a parent initial acknowledging that you went over their lesson notes with them so they know what they should be working and focusing on. An extra punch can be earned if the student arrives exceptionally well prepared! 10 punches = a prize. Other collector cards include learning 5 note scales (Major and Minor) and other skills. Starting in the fall of 2017, all students will be given a keychain and will be earning "Keys" to go on it by memorizing and playing scales on various levels. *Video coming soon* One absolute FAVORITE activity among my students is when I bring out "Rhythm Cups Explorations" by Wendy Stevens of www.composecreate.com Using the idea from the "Cups Song" you've likely heard on the radio, Wendy created a crazy fun way to reinforce rhythm reading using all sorts of ways to tap and pass cups! There are even accompaniment tracks for every page of Rhythm Cups at several different speeds. Students LOVE to see if they can go faster and faster without making a mistake (or without ME making a mistake!). 1-2 times a year, I run a studio wide themed practice incentive. They last approximately one month in length and are meant to give a refreshing boost to an otherwise ordinary routine and always come with the potential to earn a small reward at the end! During the 2016-2017 school year, the practice incentives were: Pirates "Arr Ye Ready for a Practice Challenge"! "The Magic Practice Elf" that came in December (think Elf on the Shelf, but simpler! ), and "Didn't Miss a Day in May for a DVD" Fall of 2017 kicked off with a "Wild West" practice challenge. 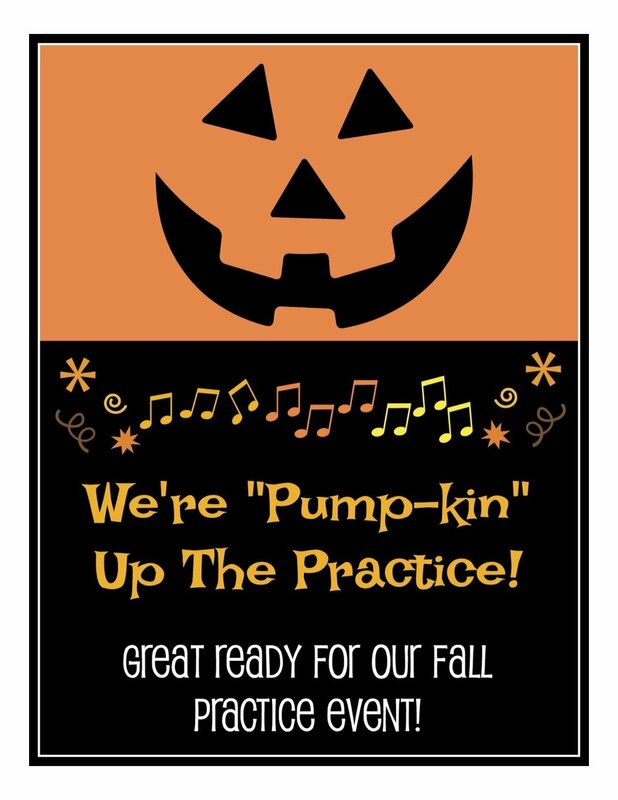 And Fall of 2018 is Pump-kin Up the Practice with 4 weeks of challenges leading up to the Fall Recital!